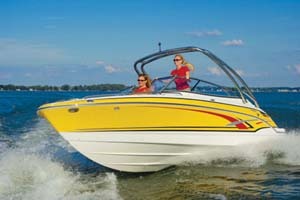 Vectra Sea Breeze 200 OB: Price-point pleasure boat makes perfect sense. This is the idea behind the new Vectra Sea Breeze 200 OB — a beginner deckboat that covers all the basics without breaking the bank. 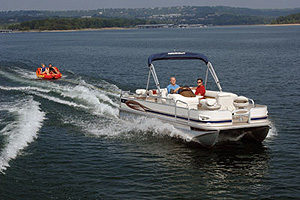 You should have high expectations from an entry-level deckboat. It should have plenty of room for an extended crew without being a burden to tow on a trailer on a regular basis, it should have features that enhance watersports activities and it shouldn't force you to take out a second mortgage to pay for it. This is the idea behind the new Vectra Sea Breeze 200 OB — a beginner deckboat that covers all the basics without breaking the bank. Even through it's only 20 feet, 4 inches long, its wide 8-foot, 6-inch beam is carried forward on a modified-V hull to make room for a total of 12 people. Watersports action is an obvious priority. The 200 OB has more than enough storage for all your toys and safety gear, including carpeted areas under the bow seats and the rear bench seat as well as a large ski locker in the sole. You'll want to invest in the ski tow ring option for waterskiing and tubing, and there's an optional wakeboard tower available for those who like big-air sessions. The gated portside walk-through transom ensures convenient access to the integrated swim platform with boarding ladder. 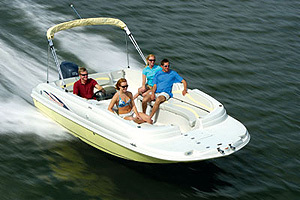 The seating on the 200 OB suggests that this boat is a platform made for day-tripping fun. You'll find a long bench seat to port and a shorter one to starboard forward of the helm — and there's another bench seat in the stern. 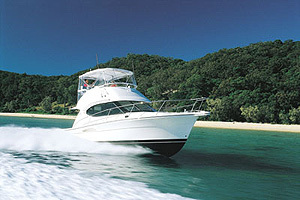 We can imagine the people who buy this boat using it for medium-range cruising and even more so for watersports. Fun in the water is also improved at rest with a huge swim platform in the bow, which includes a folding telescopic boarding ladder and a glassed-in storage compartment with a drain that would work great as an integrated cooler. In terms of price we're told this boat should list for just under $20,000 equipped with a 90 hp two-stroke Mercury outboard. Our test boat was equipped with a 115 hp Yamaha F115 four-stroke, and we think the boost in power along with the quietness, cleanness and fuel efficiency of a four-stroke more than warrants the higher base price of $24,995 — and that price includes a trailer, something we always like to see included with an entry-level boat. 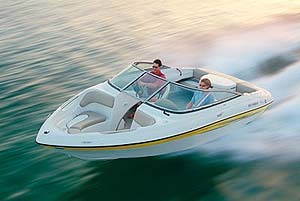 The 200 OB is rated for a maximum of 115 hp, so we were looking to get the full treatment from our test boat. We had two people aboard and a half tank of fuel (about 26 gallons or 163 pounds). Our Yamaha F115 was equipped with a 17-inch 3-blade aluminum prop. Time to plane was quick at 3.8 seconds, and we breezed past 30 mph in just under 9 seconds. At wide-open throttle and with the engine trimmed for speed we registered 38.2 mph on our GPS. 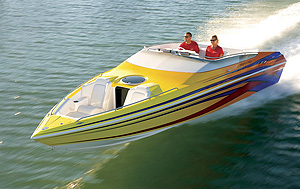 The 51-gallon fuel tank will give you a top-speed range of about 175 miles, which is excellent for this size of boat. Our most efficient cruising speed was 21.4 mph, which would increase your cruising range to more than 250 miles — this is more than enough for a full day of cruising and playing without having to pull up to the fuel dock. The hull had spunky and responsive performance. The great acceleration will help with pulling boarders and skiers out of the water, and the vented hull helps get air under the boat for a quicker holeshot. 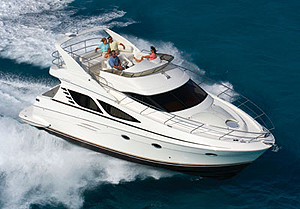 The Vectra Sea Breeze 200 OB is a great consideration for the family on a limited budget. It's got room for the kids and their friends, and it has all the features and power you need to enjoy a good pull behind the boat. The 200 OB also includes many standard features that are commonplace on larger, more expensive boats, including a walk-through transom, integrated bow and stern swim platforms with boarding ladders, dedicated cooler storage and dedicated fender storage. 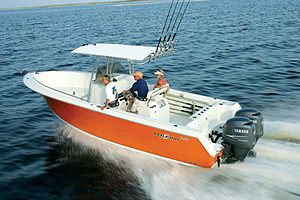 There's also a standard color-coordinated Bimini top with a storage boot. 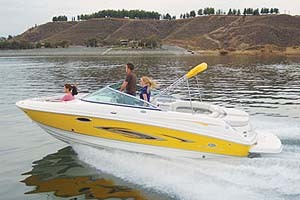 Optional features we recommend include the ski tow ring, snap-in carpet and navigation lights. Those of you who prefer stern drives will be glad to know that this boat also comes in an IO version, which includes a full-beam integrated swim platform. The 200 OB delivers on the spaciousness you expect from a deckboat along with great watersports talent and attractive pricing. If the waters near you are mostly calm lakes, rivers and bays, and you're looking for a fun day-tripping deckboat at an affordable price, the 200 OB is worth taking a look at. Editor's note: To subscribe to Go Boating magazine for the latest boat test and product reviews, visit Go Boating online.